My Minnesotan roots are feeling pretty good right now. I have wild rice soaking. There is a strawberry rhubarb dessert baking in the oven. Presently, I am shucking corn for tonight’s dinner. As I shuck the corn, the tactile and olfactory experience ushers in fond childhood memories. I feel myself in the backyard of a small river town. I am sitting on a white plastic swing of a bright blue children’s play set. I shuck ear after ear of corn, discarding the silk and husks into a brown paper grocery bag. There is a chorus of birds and the odd rhythmic beat of insects. The air is thick with the smell of sweet ripening vegetation and a hint of lilac from the shrub around the side of the house. Summer’s rich joy of freshly harvested food is an experience I enjoy every returning season. Strawberries and rhubarb are a magical combination. These bars have a buttery shortbread base. The strawberries and rhubarb are sweetened with honey – cooked into a sweet compote and spread over the crust. The compote is topped with spiced oatmeal crumble. The smell when these emerge from the oven is too much to not enjoy a few nibbles. The bars are best chilled in the refrigerator they are more set up for serving. Shortbread crust with honey, strawberry and rhubarb compote and topped with spiced oatmeal crumble. 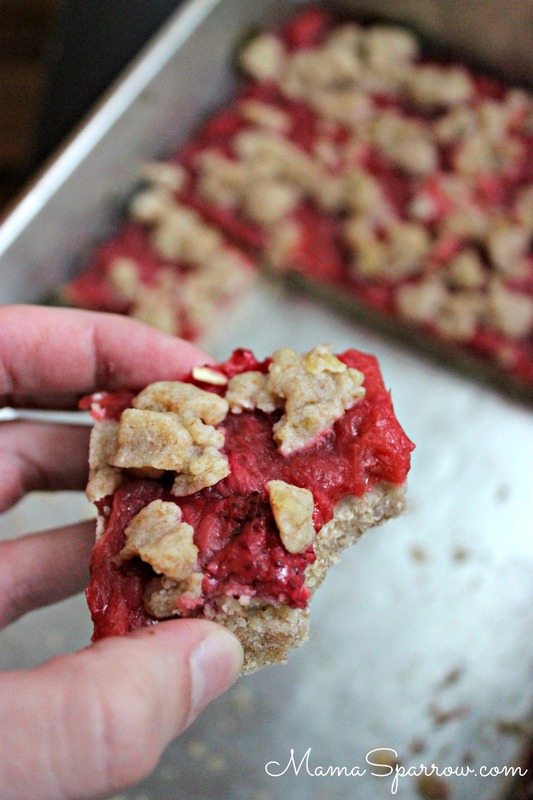 These sweet and tart bars are tasty when served chilled. Remove the pre-baked crust from the oven and reduce oven temperature to 325 F. Spread the fruit compote over the hot crust. Pull the topping dough out of the freezer. Crumble the dough evenly over the compote topped crust. Some the fruit layer should still be showing. Return to oven and bake 40-45 minutes. Cool and cut into bars. In Dessert, Recipes Tagged nut free, soy free, vegetarian Bookmark the permalink.